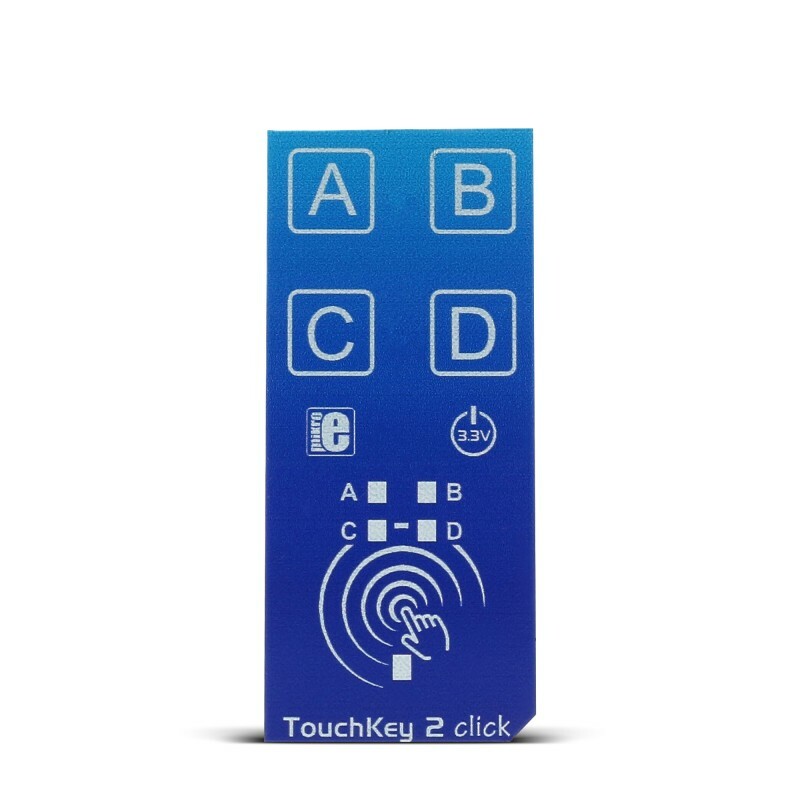 TouchKey 2 click has four capacitive pads powered by Microchip's ATtiny817 which has an integrated touch QTouch® controller. The click is designed to run on a 3.3V power supply. The four LEDs onboard the click indicate when the Key (Pad) is pressed. 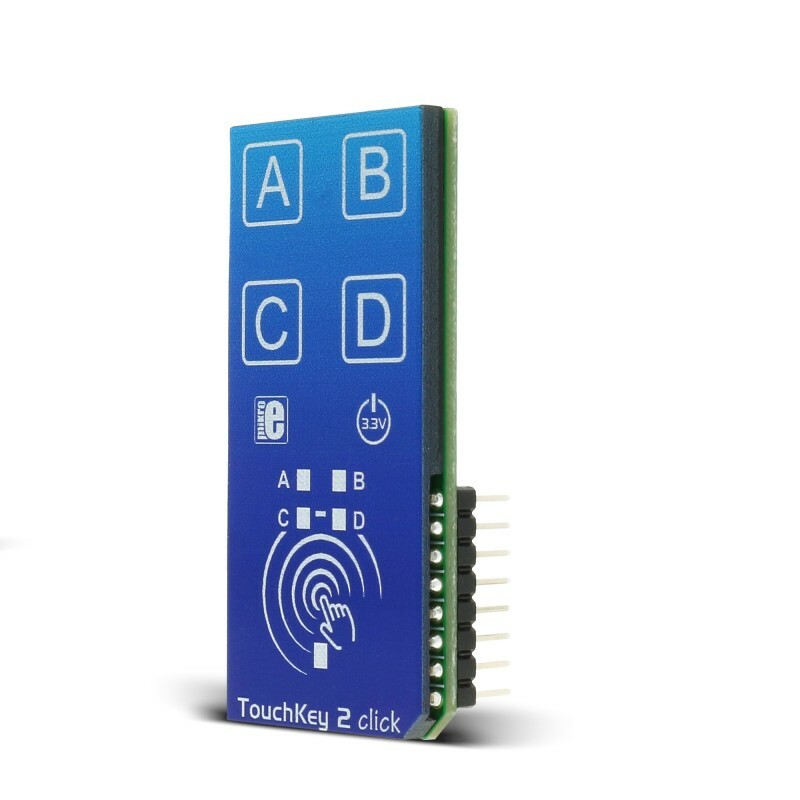 TouchKey 2 click communicates with the target microcontroller over UART interface. TouchKey 2 click has four capacitive pads powered by Microchip's ATtiny817 which has an integrated touch QTouch® controller. The click is designed to run on a 3.3V power supply. The four LEDs onboard the click indicate when the Key (Pad) is pressed. 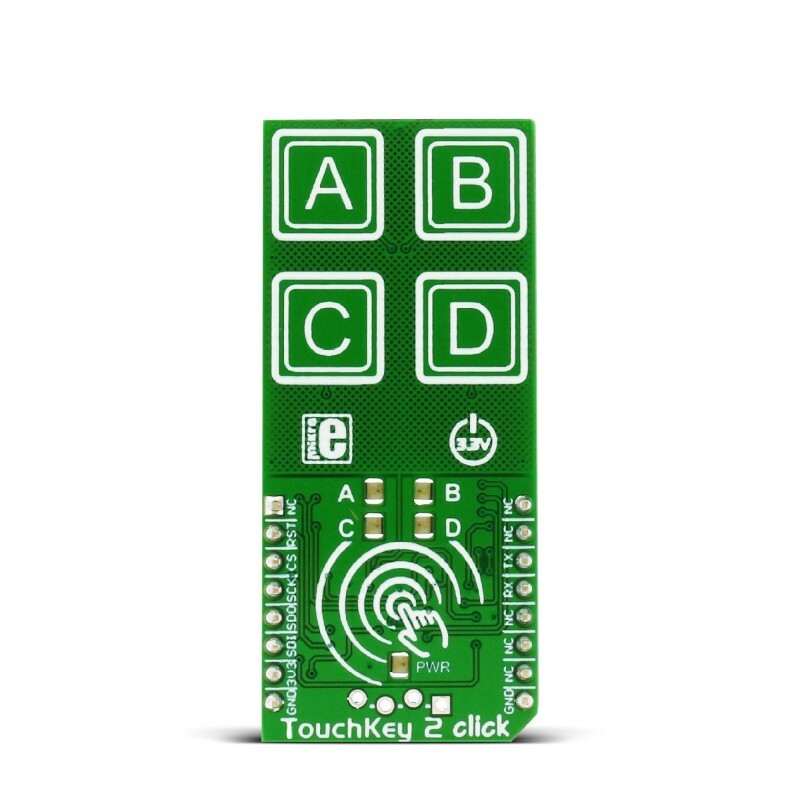 TouchKey 2 click communicates with the target microcontroller over UART interface (SPI interface is optional). You can use TouchKey 2 click in all kinds of conditions, without fearing something will happen to it due to moisture and water droplets falling on it. The plastic overlay on the TouchKey 2 click protects the board from moisture. Thanks to this feature the electronic components are safe. The ATtiny817 has a driven shield for improved moisture and noise handling performance. 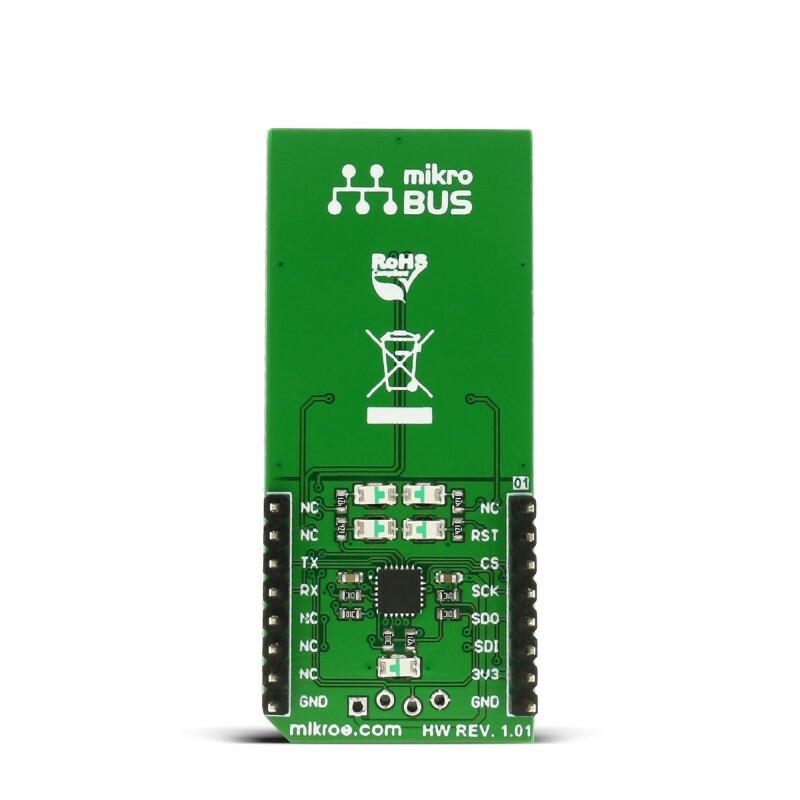 Microchip's ATtiny817 is a microcontroller that uses an 8-bit AVR® processor with hardware multiplier, running at up to 20MHz and with up to 8KB Flash, 512 bytes of SRAM and 128 bytes of EEPROM. ATtiny817 uses the latest technologies from Microchip with a flexible and low power architecture including Event System and SleepWalking, accurate analog features and advanced peripherals. 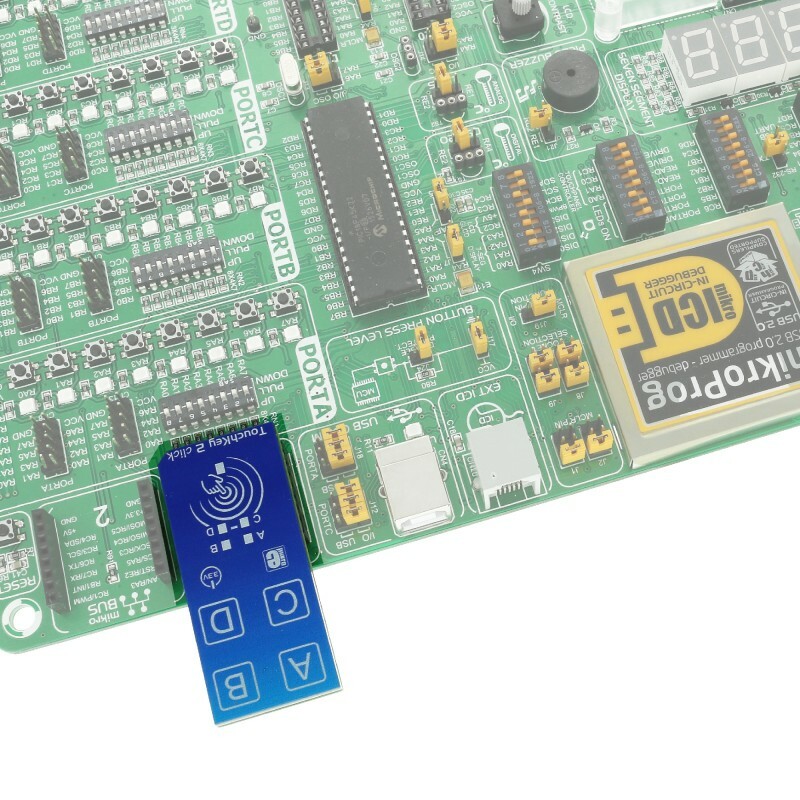 Capacitive touch interfaces with proximity sensing and driven shield are supported with the integrated QTouch® peripheral touch controller. The module supports wake-up on touch from power-save sleep mode. Capacitive buttons can be toggled even when placed under a layer of glass or paper. There are four LEDs for four touch keys. If key A is pressed LED_A is ON, etc. In addition, there is UART communication between ATtiny817 and main MCU. Note: The header onboard the TouchKey 2 click can be used for device programming. Current firmware sends data packets via UART (on which the demo example in our library is based). SPI communication is possible with firmware modifications. This table shows how the pinout on TouchKey 2 click corresponds to the pinout on the mikroBUS™ socket (the latter shown in the two middle columns). PWR PWR LED Power Supply Indication LED. Code examples for TouchKey 2 click, written for MikroElektronika hardware and compilers are available on Libstock. This code snippet initializes the MCU and display, and in an endless loop recognizes which key is being pressed. The key that was touched last is shown on the display.